Due to my own personal experience with cancer, I decided to seek out some support from Gilda’s Club – a national organization for cancer support, founded by actor Gene Wilder in honor of his wife, the late Gilda Radnor, who died of ovarian cancer in 1989. As I waited for my appointment with a staff member, I walked around in the lobby and gazed upon the various artwork that was being displayed, complete with artist statements. Most of this artwork had been done by youth expressing their own thoughts and feelings about cancer. I came upon this one painting that even thought it was not necessarily the best one, it still caught my attention. Something about it reached out and spoke strongly to me. When I read the artist’s statement, I burst into tears. This piece of work was done by a female sixth grade middle school student sharing her own experience of dealing with her mother’s cancer battle. What she has to say just touches my heart. I lost my own mother in May of 2010 when she finally passed after a long, painful battle with a recurrence of breast cancer. Other members of my family have also died from cancer, and I am currently on my own healing journey from the disease. Before I went through the cancer journey with my mom and my whole family, I really didn’t understand how cancer could impact a person. I never understood how many emotions it could lead to. Cancer was the spark. 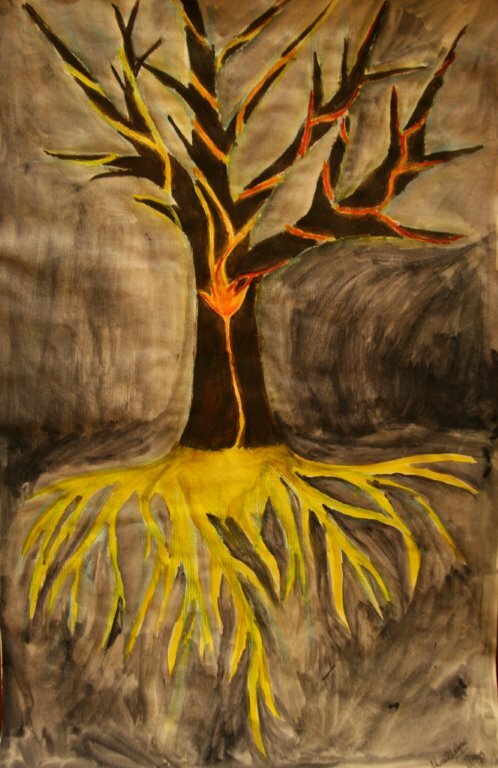 In this painting, I depicted the tree as the tree of emotions. One branch leads to the next. The fire, or what I call the spark, in the middle of the tree represents cancer. The background is dark because I wanted to represent that this tree of emotions was new to me, and the spark was the only reason that it started to glow inside me. The spark started to “run” up the tree of new emotions. The red veins represent emotions that were dark and angry. The yellow veins represent emotions that had hope and love in them. The single vein that ran to the roots was the deepest emotion that I experienced/ learned: how to care. Before, cancer seemed like an issue that was overrated, and I really didn’t care, because it happened to other people. My grandmother had died of non­Hodgkin’s lymphoma, but it was before I was born, so I was not directly affected by it. When I saw my mother going through it, it was different. That’s why all these emotions are in the dark. Now as the spark begins to light up the tree it opens me up to one emotion I never had for other people: caring. It was like a beacon to my dull world. So I wanted to show that even if cancer seemed like a raging fire, it helped me experience all these emotions I never had. It helped me feel more complete. I realize someone can go through a lifetime without experiencing any deep, all altering emotion. I look at this spark, that lit my fire to make me a passionate, caring person.